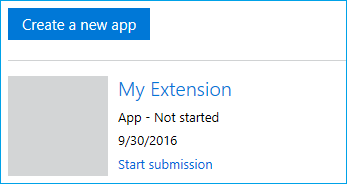 Microsoft Edge extensions are packaged as AppX, similar to how Universal Windows Apps are packaged. As of Windows 10 Anniversary Update, a new schema has been introduced for AppX that allows an AppX to include a Microsoft Edge extension as its content. If you already know how Microsoft Edge extension AppXs are created, you can skip to Using ManifoldJS to package extension to learn how to use a Node.js based tool to do all of this for you! At the root of the folder, you should include an AppXManifest.xml file. This file is used to specify the contents and layout of the package. You should also have an Assets folder which contains the UI assets to be used in the Microsoft Store, and an Extension folder that contains your extension's files (scripts, icons, etc). You can create a different folder structure for your package, but the folder structure must match the AppXManifest values. The AppXManifest file is an XML document that contains info the system needs to deploy, display, or update a Windows app. This file also includes package identity, capabilities, and visual elements. Every app package must include one AppXManifest file. DisplayName="[REPLACE WITH RESERVED STORE NAME]"
Square150x150Logo="[REPLACE WITH RELATIVE PATH TO 150x150 ICON]"
Square44x44Logo="[REPLACE WITH RELATIVE PATH TO 44x44 ICON]"
Description="This is the description of the extension"
Navigate to Windows Dev Center. Select the name of your extension. Navigate to the App identity page which is under the App management section (after you've registered your app). Description - This is a copy of the description in your extension's JSON manifest. Description="This extension will allow you to quickly print by clicking the browser action." 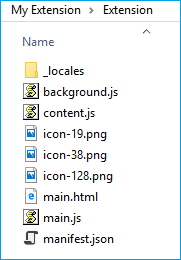 Within the Assets folder you will need three different icon sizes. These icons will be used in the Microsoft Store and the Windows UI. For more information on these icons, see the Design guide. Copy your extension files (keeping the folder structure) into the Extension folder. Make sure manifest.json is at the root your Extension folder. If your extension supports more than one language, you may want to configure the AppX package with all the locales that you need so that the correct localized icon and description appear in the Microsoft Store. See Localizing extension packages for more information. To create an Appx, you'll need to find the path for makeappx. This is usually located in the following location if you're on a 64-bit machine. You may want to unpack a previously generated AppX and use it as a starting point for the next iteration of your extension or to confirm that the AppX was created correctly. C:\Program Files (x86)\Windows Kits\10\bin\x64>makeappx.exe unpack /v /p "C:\Extension\MyExtension.appx" /d "C:\Extension\My Extension"
You can test your Microsoft Edge extension AppX package by sideloading it in Microsoft Edge. Sideloading the extension AppX package is similar to sideloading a Universal Windows app. You will need to create a certificate for signing the package, and then add the package to Windows. See How to create an app package signing certificate and How to sign an app package using SignTool for info on the signing and certification process for packages. 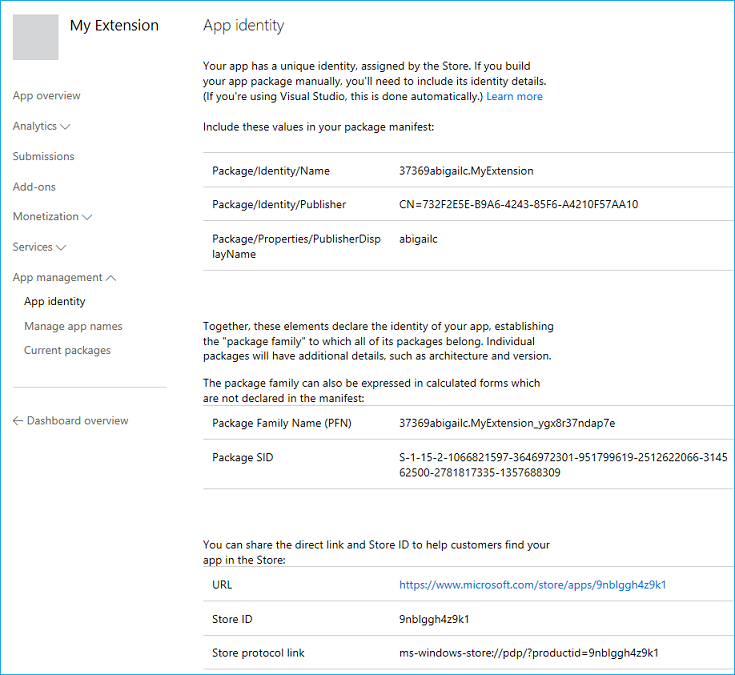 You do not need to sign an extension package before submitting it to the Microsoft Store; the Store ingestion process will take care of that for you! After you’ve signed the package with the certificate that you created, the certificate is still not trusted by the local machine for deployment of app packages until you install it into the trusted certificates store of the local computer. You can use Certutil.exe, which comes with Windows to do this. As of the Anniversary Update, you can programmatically sideload your extension in Microsoft Edge with WebDriver, enabling automated testing of extensions when Microsoft Edge is launched in WebDriver mode. This will allow you to set up automated tests for any extension that manipulates content on a page and verify that the correct behavior is exhibited. To sideload your extension for automated testing, you'll need to store your extension's folder under %LOCALAPPDATA%\Packages\Microsoft.MicrosoftEdge_8wekyb3d8bbwe\LocalState\. Once your extension is in the LocalState directory, you'll need to create an EdgeOptions object, and add the extensionPaths capability to it. The value of this capability is an array of absolute paths to the extensions (in the LocalState directory) you wish to have side loaded when Microsoft Edge starts in WebDriver mode. Check out the following C# file for a complete sample on side loading extensions in Microsoft Edge with WebDriver.